General purpose desktop model is perfect for home or office. Kickstand raises calculator on an angle for easy viewing. Large display for excellent readability. Lightweight and easy to use. Business desktop model is perfect for office. 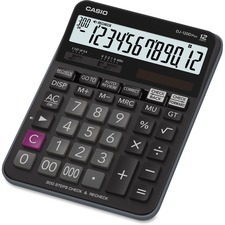 Kickstand raises calculator on an angle for easy viewing. Large display for excellent readability. Power Source(s): Battery; Solar; Display Notation: Numeric; Number of Display Digits: 10; Display Characters x Display Lines: 10 x 1.